I grew up around horses, but now that I live in the city my daughter rarely sees them. The horse-loving gene runs in my family, so I took her to the Western States Horse Expo at Cal Expo in June to give her some early exposure. She was 15 months old so there aren’t any activities for her to participate in, but I knew I could make it fun for her anyway. The Horse Expo has only been around since 1999 so the organizers are still trying to figure out how best to serve serious horsemen and –women. 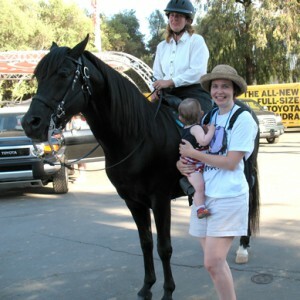 There are a fair number of fun activities for kids though, especially if the kids have some interest in horses. At the Young Rider arena, kids can make horse-shaped cookies, paint a real horse, ride ponies, and win prizes. Throughout each day, there are breed demonstrations and chances to meet all kinds of horse breeds up close and personal, including rare ones like Haflingers, Kiger Mestenos, Gypsy Vanners, and Peruvian Pasos. At the Breyer Model Horse booth, kids can paint model horses for free and take sculpting and tackmaking classes (at additional cost). Breyer even holds a model horse show where kids can bring out their favorite models to be judged and win prizes. Throughout the event, there are horses of all different breeds and disciplines that are casually ridden around Cal Expo and the riders often stop to talk to onlookers. This year, we saw an Andalusian stallion in traditional Iberian tack, a Friesian stallion (like the horse in LadyHawke) ridden by a woman in Spanish costume, a previously-wild mustang calmly under saddle, pack donkeys, and a black Arabian stallion who was a movie star. My daughter and me with TC Bey Cedar ("Beyley"), an Arabian stallion by Bey Shah who did his own stunts in the movie Hidalgo. The black Arabian stallion was just hanging out in a circle of people, looking bored but still friendly. My daughter had a good time seeing all the horses, but she didn’t want to touch them because their size intimidated her. We spent awhile looking at the black stallion until my daughter got up the nerve to pet his nose. That was exciting to me because he was the first horse she ever petted. After that, we learned just how special this horse really was! The stallion, nicknamed “Beyley,” portrayed the prince’s black racehorse, Al Hattal, in the movie Hidalgo. He had no stunt doubles, so any scenes featuring Al Hattal were played by Beyley only. Beyley was spotted by talent scouts and purchased by Disney when he was four years old. Disney had Beyley trained to rear, “fight,” and do other exciting horse tricks. When the movie Hidalgo began shooting in Morocco, Beyley was sent over there for his scenes. After returning from Morocco, a half-share in the horse was sold to a local trainer who fell in love with him. Disney wouldn’t sell the entire horse because they wanted to use him in other films. Unfortunately Beyley had a pasture accident and badly hurt one of his knees. He was laid-up for four months, at which time Disney said they couldn’t use him anymore. They sold the remaining half of the horse to the trainer who loved him. Beyley lives a life of luxury on the island of Oahu, going for rides on the beach and enjoying the companionship of his harem of mares. Occasionally he goes to various horse events as an ambassador for his breed. People are shocked to learn he’s a stallion because he’s so calm and kind. At the time, I was completely puzzled by this description. I’d never seen a horse with green eyes in my life, and I couldn’t imagine what a yellow horse with green eyes would look like. It actually sounded a little scary. Champagne Spritzer, a classic champagne tobiano Missouri Foxtrotter filly owned by Myrna Warfel of Ridin' High Ranch LLC and photographed by Linda Vishino of Zorro Farms. 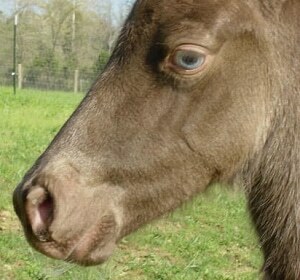 Champagne foals often have bright blue eyes. 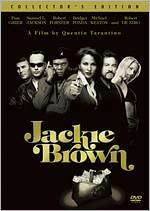 Fast-forward to a few years ago… When I heard the song again in the Quentin Tarantino movie Jackie Brown, I had a flashback to my childhood. But this time, the meaning of the song suddenly hit me. The Tennessee Stud was probably a gold champagne Tennessee Walker with hazel eyes. Now it made sense! I first learned about champagne horses by accident when I read about Khalvin Khlein KPM, an amber champagne three-quarter Arabian grandson of Khemosabi. Khalvin’s dam was a champagne Half-Arabian mare who probably got her color from the Saddlebred side of her pedigree. (She also had Quarter Horse breeding.) I became interested in equine color genetics around that time, so I did more research into this unique gene. Cita Champagne, a gold champagne AQHA mare owned and photographed by Audra Pennebaker of Snakewater Farms. She's considered a "self-gold" champagne because her mane and tail are the same color as her body. 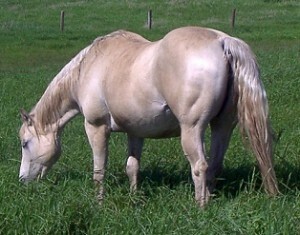 Many other gold champagnes will have a lighter mane and tail than the body color. Champagne is a dominant modifier gene like cream or dun, which means that when a horse inherits it, the gene affects or dilutes the basecoat color. For example, when the cream gene is applied to chestnut, a palomino results. When champagne is applied to chestnut, a gold champagne is produced, which can look deceptively like palomino but has some distinct differences. A gold champagne is a horse with a yellow-gold or orange-gold body color (often with a pronounced metallic sheen), blond or white mane and tail, light-colored eyes, and purplish-pink skin. (There are some gold champagnes with manes and tails the same color as their bodies – they’re referred to as “self-gold” champagnes.) Throughout history, gold champagne horses were often called “pumpkin-skinned” or “light-skinned” palominos. An amber champagne horse results from the champagne gene applied to bay. The horse may appear to be buckskin at first glance, but then you’ll notice the mane, tail, and legs are actually a chocolate color, the gold body color has a metallic sheen, the eyes are light, and the skin is a purplish-pink. Perfections Champagne Callalily, a classic champagne Missouri Foxtrotter mare owned and photographed by Cathy Hill of Five Hills Farm. Even though she's in her winter coat, you can still see the metallic sheen and some reverse dappling. She also illustrates the monochrome color of classic champagnes (black + champagne). Classic champagne is produced when champagne is applied to black. Some people describe it as “Weimaraner-like” because it’s a monochrome color, others have called it “lilac dun,” and still others confuse it with grulla (dun + black). 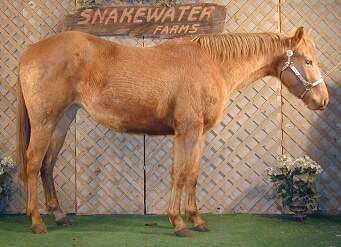 The horse has a muted brownish body color with a metallic sheen, and the legs may be a darker shade of the body color. The eyes are light and the skin is a purplish-pink. Some other newly discovered shades of champagne include grey champagne and sable champagne. When grey and champagne combine, the genes are considered co-dominant so the horse never completely greys out. At a distance, grey champagnes’ coats appear white or very light cream with a metallic sheen (sometimes accompanied by a brown-tinted mane and tail), but upon closer inspection you see a large amount of champagne-colored fleabites. They also tend to have very heavy, almost black, mottling or freckling on their pink skin. There are even more shades of champagne created when the champagne gene and cream gene are applied to a basecoat color. For instance, gold cream champagne results when a champagne gene and a cream gene combine on a chestnut basecoat. Amber cream champagne is produced when champagne and cream are applied to bay. Classic cream champagne results from champagne and cream applied to black. As you can imagine, horses with these two different dilution genes are generally very light in color, but they can have brown-tinted manes, tails, and legs. As with all horses that carry the champagne gene, cream champagnes have light eyes and purplish-pink skin. Peponita Poco Lass, a grey champagne AQHA mare owned and photographed by Shari Beymer of Beymer Paints. As if this gene wasn’t complicated enough, champagnes may undergo color changes as they age. Their pinkish skin may darken to a purple color and become very mottled or freckled. Their eyes, which could be bright blue at birth, could change to hazel or amber in adulthood, and sometimes go through all three colors during the horse’s lifetime. Coincidentally, not long after I started researching champagne horses, I discovered a well-known classic champagne Tennessee Walker stallion named Champagne Look in the town where I live. His dam, Champagne Lady Diane (foaled in 1969), made the color famous. She was given her name because her classic champagne color was reminiscent of sparkling wine, and the few people familiar with the unique color called it “champagne” in honor of the mare. However, it would take many years before geneticists and breed registries would acknowledge the color. 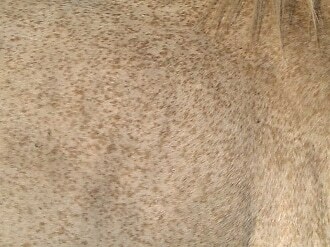 A closeup photo of the champagne flecks in Peponita Poco Lass' coat. Photo by Shari Beymer. Today, geneticists don’t believe that Champagne Lady Diane was the first champagne horse, considering that stories have been passed down for many years about “buckskin” and “palomino” horses with pink skin and light eyes. 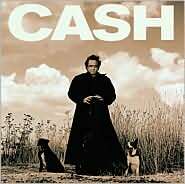 (In addition, “The Tennessee Stud” hit the music charts ten years before Champagne Lady Diane was foaled.) 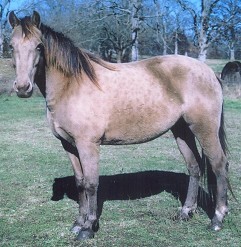 It’s believed that Champagne Lady Diane owes her color to her dam Mack’s Golden Girl H, probably a gold champagne mare, and there are other lines in Tennessee Walkers that carry the champagne gene as well. Champagne is found in a number of American breeds, including Saddlebreds, Tennessee Walkers and related breeds, Quarter Horses and related breeds, and American Cream Drafts, among others. There are documented part-Arabians with as much as 7/8 Arabian blood that express the champagne gene. A couple of years ago, my grandmother in Kansas purchased a 20-year-old Missouri Foxtrotter mare as a companion for her retired Arabian gelding. Over the phone I asked my mother what color the mare was, and she hesitated for a moment. “She looks buckskin, but she’s kind of a funny color.” My ears perked when I heard this because I knew champagne was found in Foxtrotters, and “funny color” is a good way to describe champagne when you’re not familiar with it. So I began asking the probing questions: What color is her skin? Purple with freckles. What color are her eyes? A funny light color. Eureka! She had to be a champagne-colored horse. I was able to verify it in person, and was amazed to see even her winter coat had a metallic sheen. Champagne horses are out there, but we may not always know it when we find them. If you ever came across a horse that had a color you just couldn’t describe, or it didn’t quite look like the buckskins, palominos, and duns you’d known before, maybe that horse was a champagne. Years ago I saw Michael Crichton’s first movie Westworld but never noticed anything memorable about the horses…until I watched the movie again in 2002. As I admired the beautiful horse Yul Brynner’s robot character was riding, I noticed something different about it – he was amber champagne! He looked like a buckskin, but he had light eyes and light skin. I tried to find information on the web about the horse but never discovered what breed he was or where he came from. There are a few sites on the web that explain the champagne gene and provide many reference photos of champagne horses. My favorites include the International Champagne Horse Registry at www.ichregistry.com and the Champagne Horses Website at www.champagnehorses.net. Originally featured in the January/February 2005 issue of Horsing Around magazine.